Synopsis:Environmental disasters have forced most of humanity to live inside Roaring Rocket Amusement Park. Everyone is happy riding broken-down rides except for Kai. When Kai spots a healthy tree inside a giant maze, he wonders if orbs from that tree can transport him to a new green planet. Kai’s friend, RJ, tries to talk him out of his dreams but Kai persists. I enjoyed the premise of this post apocalyptic world where a group of people have taken refuge withing an amusement park. Kai, is not convinced that he is safe at the amusement park, he want to flee the flame-ridden planet to find a safe haven. Despite his friend’s warnings he set out on a journey to get to the biggest Orb Three, because he is convinced that his escape lies in this three. In his journey Kai learns a lot of lessons about other people and about being kind. I did enjoy the story, but the story felt too rushed and it lacked any depth in its characters. The artwork was nice, but whoever was tasked with drawing a camel for this book does not know the different between a camel and a dromedary. Camel are two-humped, the drawing in the book is one-humped (that is a dromedary). As a children’s book I believe that things like that should be on point, because these books are supposed to not only entertain children but also educate them. The book also had a few inconsistencies where there were talk about not having any coconuts and then suddenly the orbs were called coconuts. Apart from that it was an okay read. 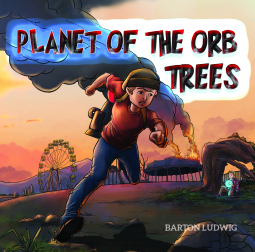 This entry was posted in adventure, Book Reviews, Children's Fiction and tagged Barton Ludwig, book review, book reviews, Children's Fiction, Heartlab Press Inc., Independent Book Publishers Association (IBPA), Outdoors & Nature, Planet of the Orb Trees. Bookmark the permalink.